The 31st Infantry Regiment details the history of the unit known as the "Polar Bears" from its inception in 1916 through virtually every war in modern day history. 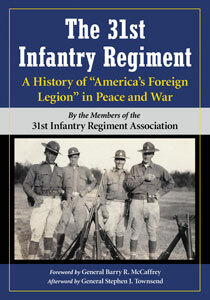 The work is a colloboration by the members of the 31st Infantry Regiment. Three authors have chronicled the unit that has served with honor, duty, and sacrifice to preserve freedom for the people of the United States of America. Karl H. Lowe contributed the bulk of the content. James B. Simms provided the 4th Battalion, 31st Infantry experiences in Vietnam. During deployment training for Vietnam, I was assigned as intelligence officer of the 6th Battalion of the 31st Infantry. In-country, when Delta Company’s commander was wounded, I assumed command of that unit for six months. I've provided editing and written the chapter: "10th Mountain Division era" – including and especially the 6 deployments of the 4th Battalion, 31st Infantry after 9/11.